Today's lifestyles are busier than ever. We work too hard, sleep too little and eat too much. Our internal systems become unbalanced and very soon you start to experience the physical symptoms. Fatigue, wrinkles, stiff muscles, deteriorating eyesight: all too often the cause can be found in over-burdened blood vessels. MASQUELIER’s® can’t take away the stress of everyday life, but we can help you to limit the damage. MASQUELIER's® French Pine Bark Extract with Original OPCs actively counters the negative effects of stress by strengthening your body from within. In doing so it improves the condition of your blood vessels, guaranteeing optimal blood circulation and the efficient removal of waste materials. You feel the energy and vitality flowing back. Good blood circulation is a prerequisite for a healthy life. That’s why MASQUELIER's® French Pine Bark Extract with Original OPCs contains the powerful antioxidants that protect against free radicals and keep your blood flowing smoothly. Your veins and capillaries remain flexible and strong, and waste materials are effectively drained. MASQUELIER's® French Pine Bark Extract with Original OPCs helps you to increase your physical resilience, however busy and demanding your life may be. Strengthens and retains collagen and contributes to supple and elastic skin. 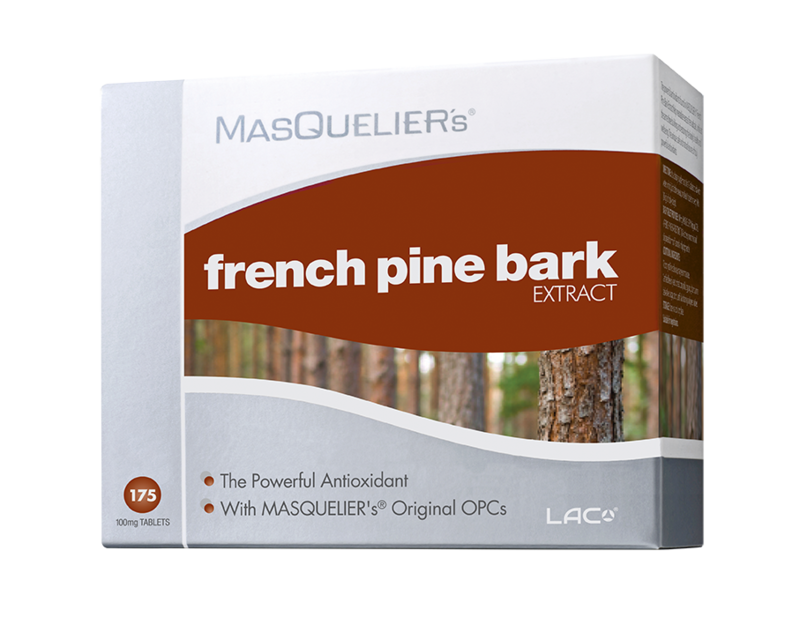 MASQUELIER's® French Pine Bark Extract with Original OPCs is available in packs of 50, 175 and 300 tablets. The recommended maintenance dose of MASQUELIER's® French Pine Bark Extract with Original OPCs is one tablet, taken once or twice a day according to need. The best moment to take MASQUELIER's® French Pine Bark Extract with Original OPCs tablets is 30 minutes before a meal, or between meals, with a large glass of water or juice. Taking the tablets with a meal will not have an adverse effect on the efficacy of the product provided you don’t take the tablets with milk, yogurt or other protein drinks or food. For adult use only. Recommended daily intake must not be exceeded. When pregnant or breast-feeding, consult your qualified practitioner before use. Other ingredients: bulking agent (microcrystalline cellulose), anti-caking agent (magnesium stearate#) # vegetal origin. Professor Masquelier dedicated a lifetime of research to his unique discoveries and their beneficial effects on microcirculation. Microcirculation is the movement of blood through the body by the smallest blood vessels and capillaries. As we age, these microcirculatory vessels lose their strength and flexibility and their ability to deliver nutrients to all the cells and organs in our body is gradually degraded. The good news is that research and numerous scientific studies (not to mention a little common sense) tell us we can alleviate or halt this process. We can do this partly by eating properly, but also by taking specific nutrients that take the form of the selected OPCs found only in MASQUELIER's® products. By supporting antioxidant defence on a cellular level and helping the microcirculation system stay strong and supple. Healthy microcirculation assists nutrient and oxygen delivery throughout the body, providing support for the heart and all vital organs. Supporting the microvascular system can provide relief for heavy and tired legs. Eyes have the body’s most intensive microvascular system, and good eyesight is strongly associated with a healthy microvascular function. Healthy microcirculation leads to well-nourished skin. This helps to maintain skin quality and tone for a more youthful appearance. Healthy microcirculation aids in optimum cellular nutrition. This provides vitality and spark, and assists in body recovery after exercise.